The thin aluminum flashing widely used today is inexpensive, but is a poor choice in many applications. Always choose metal flashings that are compatible with the ad­joining building materials to prevent galvanic corrosion. Also choose flashings that will last at least as long as the siding or roofing materials where they are to be placed. 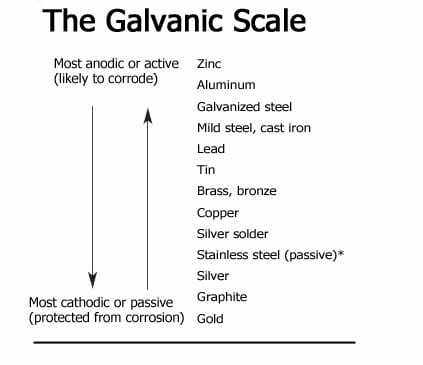 When incompatible metals are in direct contact, and the materials remain wet, the more active metal corrodes and the passive metal is protected (see The Galvanic Scale, below). CLICK TO ENLARGE Avoid placing different metals in direct contact unless they are close on the galvanic scale. *Note: Most stainless steel used in residential construction is passive, usually Type 304. The more durable Type 316 is recommended for coastal areas exposed to salt water and salt spray. Aluminum. Most residential wall flashing today is made from light-gauge aluminum “coil” stock because it is low-cost, easy to bend, and holds paint well. However, the aluminum alloy commonly used in flashings tends to pit and oxidize and pit in salty or polluted air. Unpainted aluminum flashing will also corrode in contact with pressure-treated wood, concrete, mortar, or other alkaline masonry materials. Also aluminum cannot be soldered, limiting it to simple profiles. If using aluminum, use at least .019 in. coil stock, preferably .022 to .024-in. Some home center coil stock is .017 or thinner. Choose prefinished stock for difficult environments such as urban areas with air pollution, as these are much more resistant to corrosion. However, cut edges are still vulnerable. Also be aware that the actual thickness is less than the nominal thickness on pre-painted stock. In coastal areas, .024 to .027 in. coil stock is preferable and still thin enough to be formed with a portable sheet-metal brake. However it’s best to avoid aluminum altogether if you are close to salt water. Heavier .027 and .032 in. material is called “gutter stock” and used to form seamless gutters. Copper. Copper flashings are a good choice for many applications, but expensive. Two types are available: soft and cold-rolled. Soft copper is very malleable and use­ful for molding into irregular shapes. The harder cold-rolled material is a better choice for most applications, be­cause it is stronger and more durable. Copper flashing thickness is rated by oz. per sq. ft. and is typically 16 or 24 oz. Copper flashings are easy to solder and corro­sion-resistant, even in polluted air and in contact with masonry, but should not be in contact with galvanized steel. Nails in contact with the copper should be copper or stainless steel. Over time, all unpainted copper will oxidize and develop a green patina that protects the underlying copper. While most people find the patina attractive, the runoff of the oxidation can leave streaks of blue-green stains on the siding or trim. Some experts caution against using copper or lead-coated copper in contact with red cedar or redwood or rainwater that drains over the wood. Over time, the copper surface will be etched by the acidic wood runoff. Although failures of cop­per flashings are rare, they have been reported in areas of the Northeast after 10 to 20 years of service. The combination of acidic rain and exposure to runoff from red cedar is suspected as the cause. Lead-Coated Copper. Copper flashing coated with lead on both sides can work well where staining of building com­ponents from runoff may be a problem. Lead-coated copper has a less noticeable gray runoff. Also, copper flashing will react in contact with galvanized steel unless the copper is lead-coated. Lead. For special flashing applications where a high degree of malleability is required, such as chimney step flashing, lead is a good option. Lead is easy to bend and mold, and is very resistant to corrosion. Lead is relatively soft, however; so it should not be used where it will be bumped or walked on. Also, it is best to leave lead flashings unfastened on one side to allow movement. If pinned on all sides, the flashing can fatigue and tear due to thermal movement. Galvanized Steel. This is the least expensive and least durable metal flashing material. It is not recommended in harsh climates or in contact with masonry materials or pressure treated wood. Like other galvanized products, the galvanic coating will eventually wear away exposing the underlying steel to corrosion. A proprietary version called Galvalume has a much longer service life, but is still not recommended for contact with masonry or treated wood. Steel flashing is typically 26 or 28 gauge, or about 1/64 in. thick. With metal flashing, roofing, or any metal building components, the safest strategy is not to mix metals that come in direct contact with one another. Use aluminum flashing and fasteners in contact with aluminum, copper flashing and copper nails with copper roofing, gutters, etc. When this is not possible, choose a second metal that is not likely to lead to galvanic corrosion or use a physical barrier to separate the two metals. The Galvanic Scale. The galvanic scale (see Table above) ranks a metal’s tendency to react in contact with another metal in the presence of an electrolyte, such as water or even moisture from the air. Metals at the top of the chart are called anodic, or active, and are prone to corrode; metals at the bottom are cathodic, or passive, and rarely corrode. The farther apart two metals are on the chart, the greater their tendency to react and cause corrosion in the more active metal. Metals close to each other on the scale are usually safe to use together. The Area Effect. The rate of corrosion is controlled by the area of the more passive metal. For example, a galvanized steel nail (active) will corrode quickly if surrounded by a large area of copper flashing (passive). If a copper nail is used in galvanized steel flashing, however, the corrosion of the steel will be slow and spread over a large area, so it may not be noticeable. In each case, the active metal corrodes, and the passive metal is protected. • Separate the two dissimilar metals with building paper, bituminous membrane, durable tapes, or sealants so they are not in direct contact. • Coat the cathodic (less active) metal with a nonconductive paint or bituminous coating. • Avoid runoff from a cathodic metal (e.g., copper gutters) onto an anodic metals (such as galvanized steel). Wet Mortar. Aluminum flashing materials can be damaged by alkali solutions such as wet mortar. Where contact with wet mortar cannot be avoided, one option is to spray the metal with lacquer or a clear acrylic coating to protect it until the mortar is dry. Pressure-Treated Wood. Aluminum and galvanized flashing should not come into direct contact with today’s pressure-treated (PT) wood, which contains much higher levels of copper than older CCA-treated lumber. Contact with the wood can cause corrosion in both aluminum and galvanized steel. One approach is to separate the flashing from the wood with peel-and-stick flashing tape, such as Vycor’s Deck Protector. Another good option is membrane-type flashing, used alone or as a layer to separate the pressure-treated wood from the metal flashing or steel framing connectors. Other options, although more expensive, include stainless-steel (the best choice for coastal projects), copper, and lead. Plastic flashings made from PVC and other plastics are safe to use, but may not be as durable as metal in most applications. Salt Spray. Saltwater spray is very hard on steel and uncoated aluminum products and may lead to corrosion within 5 to 7 years. In these areas, the best choices are copper, stainless steel, or prefinished aluminum with a durable, heavy coating. I live about 1/4 mile from the ocean in California, and need to replace the corroded flashing and the surface material on my roof deck. The flashing goes under a stucco wall that surrounds the deck. I know that stainless steel or copper flashing would be good choices for this, but was told by a contractor that bonderized flashing would be fine and much less expensive. I am trying to decide whether to pay considerably more for stainless steel flashing. How long would bonderized be expected to last vs. stainless steel for this application? A lot of factors affect the longevity of flashing, so it’s impossible to provide exact numbers. I’ve seen deck flashing where one piece has rusted through and a piece two feet away, in the identical application, looks fine. The biggest factor that affects longevity is exposure to moisture, especially retained moisture that does not readily dry out. Direct or indirect contact with incompatible materials is also a big factor. “Indirect contact” means that the flashing does not touch the incompatible material, but rainwater washes some of the material down onto the flashing. Both masonry, including stucco, and pressure-treated wood will accelerate the deterioration of galvanized steel and aluminum. Salt spray in the air is also hard on most metals, especially steel. Bonderized steel is galvanized steel that is chemically cleaned, rinsed, and treated with a thin zinc phosphate coating that produces a dull gray finish ready for painting. The finish acts like a high-quality primer, extending the longevity of the paint, but not significantly increasing the service life of the underlying metal. Bonderized steel should be painted as soon as it is installed or is prone to form “white rust,” a white, powdery film of zinc oxide that can harm the finish. All things being equal, stainless steel and copper will long outlast galvanized steel. Assuming that the flashing is 26- or 28-gauge G-90 steel, a reasonable guestimate is 20 years of service life for the steel flashing, maybe less because of your proximity to salt water. Stainless-steel or copper, on the other hand, will probably outlast you. I would suggest looking at the extra material cost as a percentage of the entire project and decide if the peace of mind is worth the added expense. Best of luck! Making a chimney top with copper over top aluminum – does there need to be a barrier between the two because of heat, ash, or wood.? What Copper Cladding Will Turn Gray? Looking for a coated copper to put on front of a new 3rd story addition to my center-city townhouse. I don’t want it to go to verdigris (blue-green patina) — instead I want it to turn grayish over time. What is recommended? Revere Copper Products (as in Paul Revere) makes copper roofing and cladding coated with a tin-zinc alloy, which it markets as Freedom Gray. The material is prepainted with a temporary gray finish and weathers to a uniform dark gray. Another option is to use pure zinc or zinc alloys, which weather to various shades of gray. Products on the market include Rheinzink which is available in a blue-gray or graphite gray finish, and VMZinc, which makes a wide variety of zinc roofing and cladding products with various finishes including slate gray. Natural zinc tends to oxidize to a slate gray tone. Lead-coated copper is also sometimes used. It typically weathers to a dark gray, but may turn reddish after a few years depending on environmental conditions and the product’s specific formulation. In some applications, environmental issues with lead may be a concern, as small amounts of lead leach off with the rainwater. Many of these materials are primarily used in commercial projects, so they may be easier to locate and specify the proper installation details if you are working with an architect. Any of these materials will perform well over many years, but may not give the exact look you are seeking, or may end up streaked or staining other materials below if they are installed to the manufacturer’s specifications. Best of luck with your project! Wow – almost instant response! I am working with an architect and she will order the materials. We’re trying to duplicate the beautiful gray copper 3rd floor mansar- style front of a house nearby. By neither the owner or the architect of that renovation kept the records about the copper product. They don’t remember if the coating was zinc or lead. So – I am very appreciative of your detailed response. I’m hoping this will remind that architect what product he found/used so my architect can try to get it for me (I was warned that it’s pricey – good thing I don’t need much :). Could I put a layer of stainless steel flashing right over top of my metal flashing. I am putting a concrete patio right up to it . I spoke to you earlier and you confirmed that the flashing I already have on will pit. I have been told that stainless steel flashing will not pit. Will Copper and Steel Contact Cause Corrosion? My project has a shallow pitched roof that is surrounded by parapet walls. The top of the walls have been capped with copper. The flashing used on the inside of the walls is steel that has been coated with Kynar paint. The is a small contact area between the copper cap and Kynar coated steel flashing. Should I be concerned ?? When copper is in contact with steel, and the area stays wet for extended periods, the active metal – the steel – will corrode. The passive metal, the copper, is protected. The larger the passive metal is relative to the active, the greater the corrosion. For example, steel nails will rapidly corrode when used to fasten copper flashing. To be safe, it is best to isolate the two materials. Kynar is a high-performance coating and should do a good job of protecting the steel, but you could certainly get some corrosion at cut edges or nicks that expose the underlying steel. To be on the safe side, you should consider separating the two materials with a physical barrier such as peel-and-stick flashing tape (as long as it is not exposed to sunlight) or any non-conductive material such as plastic or wood. Will Concrete Cause Corrosion in Metal Cladding? I have just built a new house and have painted tin cladding around the base of the house. I am going to have concrete poured and have heard that the cladding against the concrete will rust within a couple years. Sure don’t want that to happen! What would be a good solution for this? Concrete, mortar, and other alkaline masonry materials can cause corrosion when in direct contact with aluminum and galvanized-steel flashing or cladding materials, which is probably what you have. It’s unlikely that you have tin cladding. Tin-coated steel, called “tinplate” was used on some older roofs and decorative exterior components, but is rarely used in new home construction. A heavy factory-applied coating on aluminum or galvanized steel can prolong its life, but it’s best to use a more durable metal such as copper or stainless steel in direct contact with concrete. Another option is to create a physical a physical barrier between the metal and the concrete. Peel-and-stick flashing tapes, made from synthetic rubber membranes, are often a good option as they are long-lasting and durable as long as they are not directly exposed to sunlight. Depending on the specific detail, you may be able to find a durable plastic or vinyl molding or trim piece to protect the metal. Also, pay attention to drainage of water where the two materials meet. Water is required for corrosion, so the longer this area stays wet, the more rapid any corrosion will be. Thanks for the advice. If I could find a vinyl siding material that matched my colors, could I glue that onto the flashing material. Would that work. I have also been reading about N0xyde. Do you know if this would be a good option for this purpose.? These both sounds like good solutions – you’ve obviously done your homework here. Vinyl siding is thick, durable, and UV-resistant, so it should work well as a barrier between the metal cladding and the concrete, as long as you can keep it in place. I’m not sure what the exact building detail is, but a mechanical solution is usually preferable to an adhesive. If you need to use an adhesive, it must be water-resistant and compatible with vinyl – for example, Liquid Nails Siding & Trim Construction Adhesive. A heavy coating such as Noxyde could also work, but you are relying on a thorough application without any exposed metal. Peganox (now sold by Rust-Oleum) is Noxyde specifically formulated for brush or roller application, rather than spraying. Noxyde was developed as an industrial coating for metal in harsh environments and provides a thick and flexible rubberized skin, so it sounds like a good option. To achieve an adequate thickness, you should probably use two coats. You may need to buy it from an industrial supplier. I’ve got a bay window that is leaking at the seals…evidently the existing flashing was not done properly and needs to be replaced. I have two estimates for copper and for “black metal”. The copper is twice the price. Is it worth it? I don’t know what metal was/is in the existing flashing area. Thank you! The black metal is most likely aluminum coil stock that is pre-painted or powder-coated. It could possibly be galvanized steel. Check with the contractor. White aluminum gutters, which typically last for decades, are a good example of heavy-gauge, pre-painted aluminum. In either case, the thin color coating is more for appearance than corrosion resistance, so the longevity and durability is about the same as with standard mill-finish aluminum or steel. As with any metal flashing, the thicker the flashing the better. If the original flashing corroded, then you might want to spring for copper, which will outlast you. If it leaked for other reasons, then aluminum might be fine. Aluminum is the most common residential flashing material because it is inexpensive and pretty durable. If you have aluminum flashing on the rest of your house, then it will probably work here as well. However, aluminum not a good choice in corrosive environments. Salt air in coastal areas and air pollution can be corrosive to aluminum and steel. Also algae-resistant shingles, which use copper granules, can be corrosive to aluminum and steel flashing. Thank you so much! Excellent advice! Will Copper Flashing Corrode Aluminum? I’ve got a reroofing project where we have a stone chimney that has copper cap flashing that someone has installed a membrane lap and apron flashing below. When we repair the roof, I want to replace the membrane flashing with copper. I’m wondering if we can use a prefinished aluminum drip edge without it suffering damage from the copper chimney flashing, which is about 6′ away up the roof. This is a budget consideration to not use a copper drip edge if we don’t need to. Contact between copper and aluminum, in the presence of water, will definitely lead to the premature pitting and corrosion of the aluminum. How fast this occurs depends on a number of variables – particularly the aluminum alloy used, frequency of wetting, and the surface area of the copper (the passive material) relative to the aluminum (active material). A large area of copper can rapidly corrode a small area of aluminum, such as a fastener, due to the “area effect”. The fact that the materials are separated by six feet is in your favor, but of course water runs downhill and will continually leach a little bit of the copper onto the aluminum. For example, algae-resistant shingles made copper granules can destroy aluminum gutters in several years in a rainy climate. In this case the copper granules are designed to carry dissolved copper down the roof surface. In your case, the corrosive effect will be much less, but you may notice some pitting in a few years. If you go with aluminum drip edge, look for a heavy-gauge, pre-painted stock. How much protection you’ll get with the typical light-gauge, pre-painted drip edge from your local home center is hard to say. To be on the safe side, you might consider using copper drip edge just in area below the chimney flashing. Best Flashing for Coastal Home? Two years ago, I had powder-coated aluminum flashing installed on two large exterior balconies. The flashing is in contact with vulcrum (not sure of spelling) and is cover on the superior surface with porcelain tile. Now the flashing has completely disintegrated pushing up surface tiles and requiring tile removal and replacement. I live at the beach 3 houses back from the actual ocean. What product should be used on the reinstall and what happened? I think you might be referring to Vulkem, which is a polyurethane sealant and is not corrosive to metal. However, salt air and salt spray are highly corrosive. It’s also possible that the flashing was in contact with pressure-treated wood, which can be very corrosive as well. If you are three houses in from the ocean, you need to use a non-corrosive metal. Your choices are copper, lead-coated copper, and stainless steel. All three are expensive, but should last 50 years or more. Copper would be fine as long as you don’t have redwood or cedar nearby which can stain or be stained by the copper flashing. Also, the copper with develop a greenish patina over time. If you use copper, only use copper or stainless steel nails to avoid galvanic corrosion. There are some less expensive laminated copper flashings such a Cop-R-Shield, made for pressure-treated decks, but I don’t think they would be a good choice here. Lead-coated copper is a variation that eliminates the staining issue as well as the patina. Stainless steel is the most expensive and least reactive metal you can use. It is the fix-it-and-forget it choice and the best choice for most exposed metal hardware, flashings, nails, and fasteners in a coastal home. While the material is expensive, as a percentage of the total cost of a home, it’s not that significant. Type 304 Stainless steel is fine for most uses. The more expensive Type 316 might be used for critical details with direct exposure to salt spray. Another product widely used in coastal climates is PVC flashing. It is corrosion-proof, but does not have the strength or long-term durability you are looking for. I am looking for a box shaped rain gutter, with straight sides, similar to this image. It could be a rain gutter or some type of roof flashing. I am not using it as a rain gutter but for an alternative use- I use them for growing microgreens. Any suggestions on a piece of metal this shape, that I can find at a normal hardware store or order easily online? Here in the U.S., this is not a standard gutter or flashing profile, so I doubt you would find it premade. You would need to find someone with a sheet-metal brake to form it out of “gutter coil” which is thick aluminum coil stock — .027 in. and up — often used to fabricate seamless gutters on the jobsite. Anyone who installs vinyl siding has a portable sheet-metal brake and this is an easy shape to form, so it shouldn’t cost an arm and a leg. You could also contact a sheet-metal shop, metal roofing company, or heating/ac contractor who works with metal ductwork. All of these folks could easily fabricate what you are looking for. Not sure what type of metal you want for growing, but aluminum and galvanized steel would be your cheapest options. Best of luck! PVC-Coated Aluminum For Treated Lumber? Will PVC-coated aluminum coil stock work well as a flashing for a pressure-treated deck? In general, aluminum flashing is not recommended for direct contact with pressure-treated lumber. Starting in 2004, the preservatives used in pressure-treated lumber and decking were modified to eliminate the arsenic. However, the copper content was increased and the lumber became much more corrosive to aluminum, steel, and other ferrous metals. While, in theory, pre-coated aluminum might be OK, exposed edges at cuts and nail holes are vulnerable. Also the quality and thickness of the coatings vary and accurate specs are often difficult to obtain. Also, the PVC coating used on coil stock is really just a vinyl-based paint and is probably no more durable than other pre-finished aluminum stock. A number of variables determine the rate of corrosion here: the specific type of pressure-treated wood, the thickness of the coating and the underlying metal, the amount of moisture that reaches the flashing, and other corrosive effects from air pollution and salt air (in coastal areas). For critical flashings, such as over the deck ledger, where leakage could lead to structural decay and deck collapse, I would steer clear of aluminum. Better choices are bituminous membranes, copper, or high-quality PVC. In some cases it is possible to isolate the aluminum from contact with the pressure-treated wood by using a piece of membrane flashing or heavy felt paper. But I don’t recommend taking chances with the deck ledger or other structural connections. In fact, all fasteners and connectors in contact with pressure-treated wood, including lag screws, bolts, decking screws and joist hangers, should be made of corrosion-resistant materials. Stainless-steel is the first choice for screws, bolts, and connectors and is recommended coastal environments and other harsh conditions. Heavy galvanized connectors, rated G-185, are the next best choice for steel connectors. For screws, lags, and bolts, G-185 steel and proprietary coatings, specifically tested and approved ACQ and CA lumber, are also good choices.